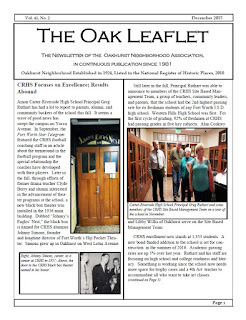 Oakhurst Neighborhood Association, Fort Worth, Texas: December Oak Leaflet Now Online! Check out this month's issue of The Oak Leaflet in full color online! This month's newsletter features a report on activities at Carter-Riverside High School, information on our upcoming ONA Christmas Dinner Party and other events, and Remembering Catherine Moylan Singleton, the first Miss Universe (an editorial by Libby Willis).